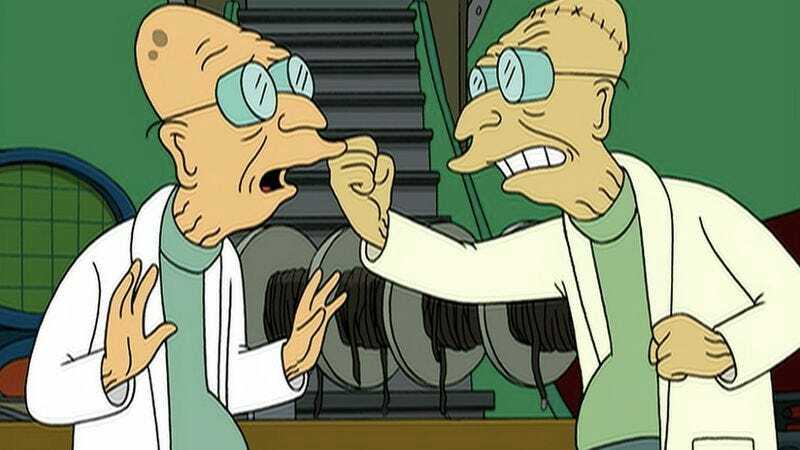 "The Farnsworth Parabox" / "Three Hundred Big Boys"
I love it when Futurama plays games. All too often, the show will fall on familiar sitcom storylines with moderate genre twists; sometimes those episodes work well, sometimes they don’t, but the plotting itself is rarely all that exciting. It’s more a structure to hang jokes and character moments off of than something to care about for itself. But on occasion, the writers will push themselves to build a story with a little more care. “The Farnsworth Parabox” is one such story. It has terrific gags and character moments, but even if you took all of those away—even if it was a bunch of unfamiliar faces going through the motions like cogs in a machine—this would still be worth watching. We begin with our story already in progress, as Farnsworth has stumbled onto his latest, and potentially greatest, invention: a cardboard box. (Wait, is it cardboard? I can’t remember if this is ever confirmed, and my notes don’t say one way or the other.) The box creates a considerable hullabaloo at Planet Express, up to and including offscreen explosions and shouting, but Farnsworth refuses to let anyone look inside. After some shenanigans, Leela looks inside, and discovers a parallel universe. Farnsworth inadvertently created a box that contains an entire universe inside it. Moreover, that universe happens to be almost exactly like ours, except that the outcome of every coin flip is the opposite of what it was in “our” universe. Which is a ridiculous conceit, at least on the surface. The episode seems to take it at face value that nearly everyone has made significant life choices based on coin tosses, and, what’s more, that a disruption in those tosses could lead to different hair colors, different brain operations, and different relationships. Given how rarely coin flips have appeared on the show in the past (maybe once? ), all of this could seem forced. But it works as a riff on one of the most commonly given explanations of the “parallel universe” theory, at once establishing the episode’s premise in the clearest possible terms—Universe A and Universe One are different but essentially connected—and joking about how literal-minded such explanations often are. It makes for a nifty thought experiment, too. The coin-flips don’t necessarily need to be literal; the real point is a universe in which small moments of pure chance operated differently, and in doing so, changed the course of lives significantly, but not so significantly as to be unrecognizable. The unrecognizable comes later. Or nearly unrecognizable, anyway. “Parabox” spends some time establishing the reality of Universe One, and playing off the idea that any parallel universe in a science fiction story is automatically the “evil” one. (This was true on Star Trek, and it was true on Buffy: The Vampire Slayer, and also in real life.) So the two Farnsworths are entirely distrustful of one another, and send their duplicates to keep watch. 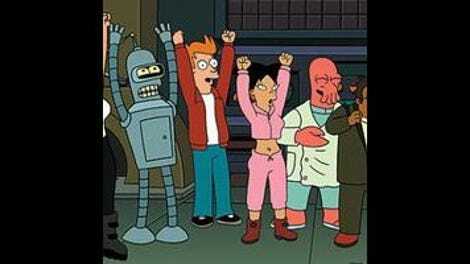 Which lets us see how the strange, off-color Universe One works, and also gives Fry and Leela a chance to meet a version of themselves who got married. To each other. Of all the various parts of the episode, the Fry/Leela negotiations are the closest to a weak point. There’s something off-putting about Fry’s constant pleading with Leela to go out with him, and it’s off-putting in a way the writers don’t seem to realize. A will-they/won’t-they relationship needs a precise balance to work, and that balance requires a fundamental lack of openness on the part of both sides. You need two people with chemistry who keep almost, but not quite, expressing their feelings for one another, so that when one of them finally takes the plunge, the moment is meaningful; then you can throw in some kind of arbitrary obstacle (usually in the form of another relationship) and drag things out for another season or two. Here, though, Fry is more than clear about his intentions, which makes his persistence more creepy than romantic. Leela’s need to make excuses doesn’t really work either. We saw them grow closer over the course of this season, and while that closeness didn’t automatically mean romance, it at least suggested a deepening relationship. But now she’s having to come up with increasingly improbable explanations as to why she can’t go on a date, and it’s unclear why that is. Well, it’s clear from a narrative perspective: The writers want the tension of a possible, but never realized, couple, and since Fry is so straightforward, Leela has to be the ambiguous one. It makes a hash of her character, and turns Fry (at his worst) into a pushy jerk who won’t take a not-quite-obvious no for an answer. Still, the payoff for all this, which has Fry asking Leela on one more date, her going to a coin flip, but then deciding to go out with him regardless of the outcome, is sweet enough. The thread is such a minor part of the episode—really, it’s just in there to give the craziness an emotional through-line—that it doesn’t really detract from the whole. The fact that Universe One Leela ended up married to Fry because a coin flipped tails instead of heads is just a way of attaching something relatable to an inherently absurd concept. What really matters is that the two Zoidbergs, feeling more put upon than usual, steal the box, which forces the Farnsworths to try and recreate their original experiment. They end up making a whole lot of other boxes, the Zoidbergs come back and end up falling into one of the universes, and the episode’s best set-piece begins: a rapid fire journey through a series of parallels that shows off a number of variations on the familiar Planet Express crew. I caught the universe where no one (at least, no one in the room) has eyes, the universe where everyone has a bobblehead, the universe where they’re all robots (Robot Fry asks Leela out; she says “Access denied” and his head explodes), the classical Roman universe, and the hippy universe. We also hear about (but don’t see) a very cold universe, and a universe that’s only women. Some of these universes are more visually inventive than others (I like the look of Robot Fry), and some of them are funnier, but none of them stands out as shockingly original. Which makes sense, given the brief amount of time we spend in each. There needs to be a concept that’s easy to instantaneously grasp in order for the chase scene to move fast and stay funny. And it is funny, and a blast to watch. The nominal originality of each individual universe is less important than their effect as a whole. This episode is a half hour which exists primarily to celebrate the giddiness of invention, the rush of discovery, and the joy of unhindered mad science. It remains a high-water mark for the show’s creativity, and it’s willingness, every now and again, to think outside the box. Yes, I did just end my review with that pun. No, I don’t feel bad about it. Having Leela be the one to open the box (right after she fools the more obvious culprits, Fry and Bender, with a box full of unlabeled booze and tangled Xmas lights) is a nice touch; she’s the “responsible” member of the ensemble who isn’t quite as responsible as she pretends to be. After the high concept shenanigans of “The Farnsworth Parabox,” “Three Hundred Big Boys” find the series in one of its more affable grooves: a series of vignettes about various characters using a sudden government windfall to improve their lives. The stakes are low, the drama mild, and nothing that happens matters all that much. (Not even Bender getting caught stealing an expensive cigar.) But the geniality throughout makes for pleasant viewing, and the script repeatedly finds way to tie various plot threads together, before finally bringing everyone into the same room for an unexpectedly thrilling—and oddly beautiful—climax. The set-up: after Zapp Brannigan and his men slaughter yet another alien civilization, he brings home $3 trillion in war booty. President Nixon, being the savvy politician he is, decides to return that money back to the people, sending everyone a three hundred dollar check to do with as they will. Every member of Planet Express gets a three-hundred dollar bill, and each one of them finds some creative way to spend it. Fry decides to buy 100 cups of coffee. Leela wants to go swimming with a whale. Bender—well, Bender ends up buying tools to steal a cigar he can’t afford, as is his way. Scruffy gets a very hip new haircut. And so on. It’s all pretty zany, but in a cheerful, mild kind of way, if that makes sense. Lots of stuff happens, but very little of it matters much. The appeal, then, is in the fairly consistent novelty. Like with the series of parallel universe boxes in the previous episode, the flow of new ideas matters a bit more than the quality of those ideas themselves, although I’d say this one stays consistent throughout. Still, the fact that no single storyline dominates for more than a minute or two at a time is what keeps this fresh. While it’s not quite as ambitious as The Simpsons’ “22 Short Films About Springfield,” it’s in a similar vein; this is more about quantity than quality, and for once, that quantity holds together quite well. Of the various stories, the most effective are Zoidberg’s and Fry’s. Zoidberg goes on a journey to discover what it means to be rich, and is disappointed with everything he learns. Not just disappointed, but actively enraged, which is what makes it all so endearing. Zoidberg’s failures are one of the defining elements of his character. He’s an outsider, a loser, a lovable putz, and while the basic “Aw, he’s kind of goofy and sad” model works well, seeing him righteously angry makes for a welcome change of pace. It also leads to an unexpectedly sweet conclusion, where Zoidberg meets some cheerful hobos, and invites all his friends to enjoy cheap hot-dogs and not worry about money so much. Fry’s story also has a sweet conclusion. Hell, it’s borderline transcendent, and in the most unexpected of ways. Throughout the episode, while everyone else is having adventures, Fry is in the background buying cup after cup of coffee. (The episode helpfully keeps track of each up with a graphic in the corner whenever he buys a new one.) Not surprisingly, the massive amount of caffeine in his system makes him increasingly jittery and irritable, which is funny in and of itself; it also makes the moment when he drinks his one hundredth cup of copy, and achieves a kind of Zen state of perfect awareness, all the more surprising. The sequence where a blissed out Fry, able to move at apparent super speeds, walks casually around the room saving everyone from a fire, is bizarrely delightful, and satisfying in an unexpected way. Given how much of a screw-up Fry usually is, and given how stupid it would be to drink a hundred cups of coffee so quickly, it’s neat to see everything turn out for the best. And the scene is beautifully animated and scored as well. Of the rest of the storylines, Kif’s struggles to give the woman he loves the perfect gift have the benefit of a clever resolution, as well as a completely out-of-left-field guest appearance from Roseanne. (A hologram version of her explains what “ambergris” is.) Leela’s sudden, seemingly random decision to swim with a whale does allow for an appearance by the world’s most obnoxious whale biologist, and the connection between her and Kif’s plot means we get a scene with Leela wearing a bathing suit stuffed with rotten fish, so that’s cool. (We also get a scene of a whale vomiting a lot, if that’s your thing.) Bender’s efforts to steal an expensive cigar go pretty much how you’d expect, although it’s nice to see him blowing smoke in people’s faces, and his comment on not getting closure, right before the cops catch him and beat the crap out of him, is a decent moment of meta. Really, though, as I said, it’s the combined effect of all these stories (plus Professor Farnsworth’s December/May-but-like-from-a-different-century romance, and Hermes making an ill-advised purchase for his son) that makes “Three Hundred Big Boys” such a treat to watch. The end result may not be as inspired as “Parabox” or as devastating as “The Luck Of The Fryrish,” but it’s still a marvelous demonstration of just how playful the show could be at its peak. Which makes it all the more sad that we’re nearly at the end. Also benefiting from Nixon’s largesse: a crack addict who decides that just this once, he’s going to a Crack Mansion. Nixon gets screwed when all the booty from the spider planet burns up. So it’s a happy ending all around, really. Man, those orphans show up at the worst times, don’t they.